Tell the mozzies to buzz off with this Maxkon Insect Trap! With this handy bug trapper you can conveniently & effectively control midges, mosquitoes, bees and other pesky bugs both indoors and out. Its sleek modern design blends in nicely with any home d?cor and makes an ideal upgrade for any patio, porch or garden. 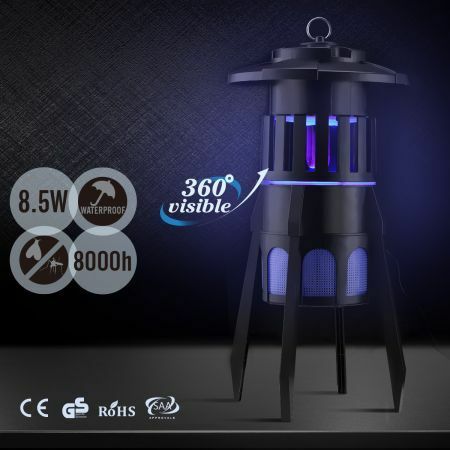 With this insect killer, you can be free and clear of chemicals and of high voltage zapping. That's right: this trap doesn't involve spraying or risky voltage. It instead uses an invisible black light bulb along with a highlighted plastic reflector for maximum insect attraction. And once they are inside, there is no escape with the twisted trap door system. Catch them once and catch them for good. With detachable legs, the trap is easily height adjustable for a suitable, insect-trapping height. And with the DC fan, the trap is all along quiet while it is trapping, so you won't be disturbed by incessant humming & buzzing or by sporadic zapping. Instead, you get proficient, silent home pest control that keeps on going with long-lasting energy efficient UV bulbs. And cleaning up after a busy night is a snap too, with the detachable bottom tray and automatic power cut-off, you can conveniently and safely clean your insect trap in seconds. With this Maxkon Insect Trap, you can take back your yard and rid your home of annoying insects without noisy zapping but by silent trapping! Does exactly what it says it does. There is no sapping sound like other bug traps which does not annoy my dog.